Many of the projects I’ve worked on in the past have come to fruition recently, which is so rewarding. I have lots and lots that I still want to accomplish but I just took the weekend off from doing anything productive! We went for a long walk in the botanical gardens looking at the magnolia, dogwood, forsythia, newly budding trees, a pond with coy, babies playing in the grass, and happy joggers. It was glorious. Back to the grind really soon…. LOVELY! So nice to see you yesterday! so very nice to see you and your stunning home and lovely friends! Great photos – especially the pool one – love the shadows! thanks Amy!! If you look closely you can see my legs in the pool. I took the photo with a disposable camera. I loved the shadows too. Love the photos–hope you had a restful weekend! It was really really nice to take a break! 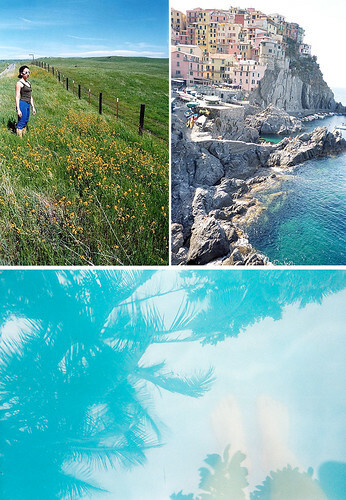 Ohh, I’ve been to Vernazza–isn’t Cinque Terre a beautiful area! yes I love it there so much. When I went during my study abroad it was relatively undiscovered by tourists. When we went back for our honeymoon it was over-run….so it changed a lot but is still a stunning place. ooooh that italy shot is gorgeous. and i KNOW! cinque terre is like disneyland now…but still so beautiful. Disney is an apt comparison. It was really sad for me. I got to go many many times during my study abroad and really experience the culture and the beautiful landscape…now it’s college guys chugging wine straight from bottles on the street. The only positive thing I can think of about the increased tourism is that the areas economy must be doing really well which I’m sure they are happy about. route 1 is a gorgeous drive. i’d love to take it all the way up to san francisco one day. oh yes, you’ve got to do it someday. It’s such an amazing drive. I especially love getting up near big sur. It’s so lovely to be in the mountains after being by the shore. The whole drive is amazing. it is truly a magical place….glad you’ve been.